The no.18 had the winning strike at home to Brighton on Saturday taken off him when it was registered as an own goal instead but he followed that by scoring with two stunning shots in the first period on Tuesday night – a low half-volley from the edge of the box and a sublime free-kick from 25 yards. The in-form England man – who started his 10th successive Premier League game – was a constant threat down the left-hand side and his all-action performance earned him a nomination by MUTV pundits Sammy McIlroy and Jonathan Greening for the club’s Man of the Match award. 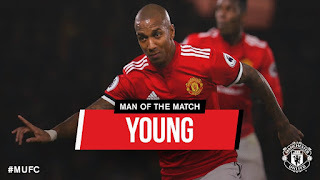 Young came out on top in the resulting Twitter poll with 77 per cent of the final vote, ahead of fellow goalscorer Jesse Lingard (17 per cent) and Paul Pogba (six per cent). Reflecting on his double, the wing-back told BT Sport: “Of course, it’s always nice to get on the scoresheet. I haven’t done that for a long while. In the game the other day [against Brighton] I tried to claim that goal but I’ll definitely be claiming these two! Young's opening goal on Tuesday night was his first for the Reds in any competition since the 3-1 win over Bournemouth in the final league game of 2015/16. He’ll be hoping to continue his excellent run of form when United face another tough game on the road against Arsenal at the Emirates Stadium on Saturday evening (kick-off 17:30 GMT).